CEDAR CITY – The Orchestra of Southern Utah has a busy season ahead, with the return of their fall recital series and upcoming auditions for young musical talents. The orchestra’s 17th annual fall recital series celebrates the wide variety of musical talent in Southern Utah across a myriad of eras, genres and origins of music. 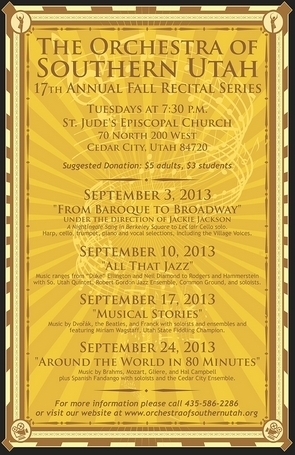 Performances will be held every Tuesday at 7:30 p.m. at St. Jude’s Episcopal Church, 70 North 200 West, in Cedar City. Admission costs $5 for adults and $3 for students; children over age 6 enter for free with an accompanying adult. For more information on the orchestra, visit OrchestraofSouthernUtah.org or email osucedarcity@gmail.com. Sept. 10 celebrates “All That Jazz,” an evening of jazz and cinema classics. Robert Gordon’s Jazz Ensemble starts off with movie music. The Southern Utah Quintet performs “Echoes of Harlem” by Duke Ellington, as well as “Love on the Rocks” and “Hello Again” by Neil Diamond. Vocal group Common Ground shares Gershwin’s “Summertime,” Haley Jean Dodgion highlights “The Sound of Music,” violinists Sara and Ruth Ipson play “Schindler’s List Theme” by John Williams, David Bolsover and Adrianne Tawa perform “Notturno” by Grieg and the Allen Family presents a movie medley. At “Musical Stories” on Sept. 17, Common Ground performs “Always on My Mind,” “Land of the Navajo” and “Nowhere Man.” The Southern Utah String Quintet plays music by Dvorak while Marin Colby and Mary Anne Andersen perform the finale of the César Franck’s romantic violin sonata. Pianist Jack Vickers plays “Cuentos del Matador” by Rocherolle and champion fiddler Miriam Wagstaff performs a traditional Irish jig and a “Texas Old-Time Fiddle Style” contest set. The Festival City Singers, vocalist Fred Dunnell and pianist Teri Kenney complete the program. The recital series wraps up Sept. 24 with the musical whirlwind trip “Around the World in 80 Minutes.” “Fandango” by Michael McLean features violin duo Tori Calamity and Jessica Chamberlain with pianist Heather Carrol and Debra Vradenburg and Linda Brimhall bring you music by Telemann. Local composer Hal Campbell’s “Three Somewhats and an Almost” will be performed by LuAnne Brown, Colleen Dowse, Caroleen Lee, June Thorley, Carol Ann Nyman, Benjamin Lee and Campbell himself. Halle and Jack Vickers join for “Russian Sailors’ Dance” by Reinhold, Brown, Dowse, Thorley, Nyman and clarinetist Sarah Solberg perform Mozart’s “Quintet in A Major, K 581,” Ben Bradshaw, Mike Wallace and Virginia Stitt play “Bassoon Trio No. 2 in G minor” by Francois-Rene Gebauer and The Reed Trio performs “Tango and Co.” by Helga Warner-Buhlmann. Playing as a soloist with a symphony orchestra takes years of dedicated work and is an exciting opportunity for young musicians. Past soloists with the Orchestra of Southern Utah have gone on to professional performance and teaching, as well as earning significant scholarships for college. Young composers are now also invited to submit their original compositions for performance by the orchestra as part of the 2014 Roy L. Halversen Young Artist Concert. The audition deadline for the Halversen Concert is Oct. 11 at 5 p.m. The orchestra welcomes auditions by young soloists, professional musicians and advanced music students from Southern Utah ages 13 to 25. Up to four will be accepted and performed at the Halversen Concert on April 17, 2014. For more information, contact Akins at 435-590-4266 or peteakins@tlc2.org.